This is the ultimate measurement of progress and your current fitness level. MyFit Score analyzes your fitness workout data and comes up with a complete fitness level and improvement score to give you a great overall gauge. This number is calculated every time you press sync as it updates this weeks MS average and also uses last weeks MS average to determine how you are doing. A poor MyFit Score means you probably aren’t doing everything you can to reach your goals. The problem: You are working out and you think you’ve been doing great. “I’ve worked out 5 times a week for the past 2 months”, but how many times have you actually worked out? Was it enough to improve? Solution:We actually tell you how many times, and give you a score based on this (consistency score). Note: To measure consistency we need to use your last weeks results. The problem: Knowing how much oxygen your heart can get to its muscles efficiently is almost impossible to know unless you get an expensive test done with a breathing tube at a local university. Solution:We calculate this using only your maximum heart rate (knowing your age) and your resting heart rate. Scoring your VO2 Max is dependent on your age. Our friends over at ShapeSense.com have supplied us with a table that will help you determine how yours stacks up. We valued this at 15% of the total MyFit Score as a ‘FIT’ person should really be able to run 10k on any given Sunday. Body measurements are easy to keep track in a book but analyzing them takes time. We give a progression score in this variable. However, each person may have a different goal on this score so we only use the ‘waist measurement’ as this maybe the only indicator that almost everyone wants to decrease. Exercise volume is a great determinate of overall progress in the gym. It is calculated by taking your weight times your reps and then calculating it over your entire workout. Over time this number should improve as your muscles adapt and you can lift more weight. We have two scores within exercise volume. Total exercise volume score and exercise volume improvement score. Obviously it goes without saying that the improvement portion of the score is a comparison of your last weeks volume to the week previous. A typical volume score is based upon the amount of exercises performed. Typically an exercise program should be made up of mostly compound exercises and ‘some’ isolation exercises. Compound exercises will yield a much higher exercise volume than isolation so we would like to encourage usage of compound exercises within your workout routines. Note: We judge this score based on the total unique exercises performed by day. We realize that this varies by gender and age and will be expanding our algorithm to include for these variables. This is a measure compared week to week. We calculate the total average exercise volume from last week and compare it to your current week to come up with a percent increase which is then scored. 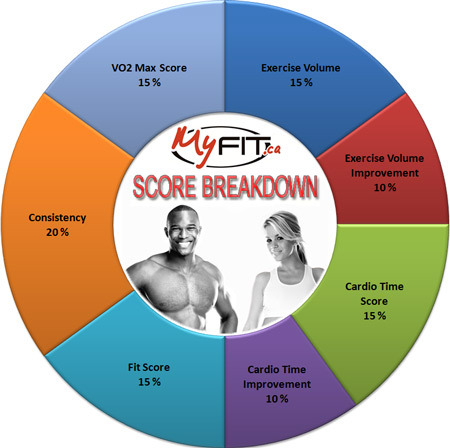 To score high in the MyFit Score you need to be improving all the time. Cardiovascular fitness is the key to longevity and also for six pack abdominals. Keeping track of cardio time is easy with this score. Everyone should be doing at least 20-30 minutes of moderately intense cardio per day. This will help your heart push more oxygen efficiently throughout your bloodstream. It will also reduce blood pressure, stress and make you better at pretty much anything physical. Increasing your cardiovascular time per week is important for losing body fat and making you fitter so we think that you should focus on increasing your cardio time every week. While increasing intensity can be just as important, time is a good measure of progress.